The makers of Javazen coffee where guys after my own highly caffeinated heart. It is the story of three entrepreneurial minded individuals, whose feelings about coffee, health and business came together to create a sensational concoction called, Javazen coffee. Blending together the taste of coffee (java) and the health benefits (Zen) of tea, Javazen coffee is the beverage that can appease your caffeine craving and taste buds, without the dreaded crash you feel long after the coffee wears off. To understand more about this coffee hybrid, let’s take an in depth look at Javazen coffee, its history and why it should be the next caffeinated beverage you try out. As unique as its name, the story of Javazen coffee comes from the minds of three friends who wanted to combine the taste of coffee with the health benefits of tea. As you know, drinking a lot of coffee can put you on a bit of a rollercoaster. You feel great on the high of caffeine, but as soon as it wears off, so does the awesome feeling of having so much energy. The founders empathized with that, so their goal was to come up with something that fit the best blend of both worlds: coffee and healthy living. After many trials, the trio came up with the perfect mix of caffeine, flavor and robustness. To top it off, their Javazen blend also has an organic makeup that naturally perks you up, and doesn’t leave you feeling drained after a few hours. 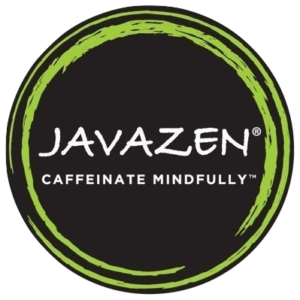 Javazen coffee was first released on their college campus, in an effort to get feedback and to see how fellow coffee addicts would take to it. Needless to say, it was an instant hit and Javazen was the new buzz around campus and the town. Thus began their journey and start in the business world of coffee. Their dream, and drink, has won them many accolades and prestigious awards, including being voted one of the “Healthiest drinks in grocery stores in 2016” by Clean Eating Magazine. So, what exactly is in this drink that makes it so appealing to a coffee lover and a clean eater? Why is it healthier than your normal cup of joe in the morning? Let’s take a look at these organic, and tasty, ingredients who not only send out a natural burst of energy that leave you feeling good, but also provides long-standing benefits that are essential to your overall health. The makeup of Javazen consists of roasted coffee beans, matcha green tea, vanilla, cinnamon and cocoa nibs. Each one of these ingredients have been instrumental in making Javazen coffee a hit amongst coffee, tea and health lovers everywhere. The coffee beans provide the robust flavor and burst of caffeine that one longs for in coffee. The vanilla and cinnamon are crucial in giving this drink a sweet, yet natural, flavor that isn’t overwhelming or blends terribly against the coffee bean. The cinnamon also helps with stimulating blood circulation, and is a great ingredient for simmering down the bitterness of the coffee bean. The matcha green tea provides an organic element whose purpose is to assist the body in naturally adapting to the caffeine. The cocoa nibs, which are the same bean that chocolate comes from, adds a touch of flavor, antioxidants and amino acids, all which are vital in creating the one and only, Javazen coffee. Now that you know the makeup of this beverage, you may now be wondering, how can I brew it? Javazen coffee can be steeped, like you would do for tea, for around four minutes in about 10 ounces of hot water. However, many coffee users also use the automatic drip, French press and percolators to brew up their cup of Javazen coffee. Both tea and coffee drinkers speak highly of its flavor and texture, regardless of how it was brewed or diffused for their drinking pleasure. 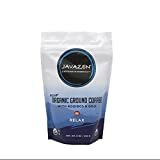 Javazen coffees you also can buy on Amazon. The pricing for the Javazen coffee is relatively affordable and quite fair. The main website for Javazen coffee gives a solid breakdown of packages, as each one is based on how many cups of coffee you like to drink throughout the day. For us totally addicted coffee drinkers, you can subscribe to get 30 packs of Javazen every two weeks for $0.99 a bag. 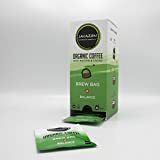 The most popular package, is the 30 packs of Javazen, delivered once a month for $1.25 a bag. 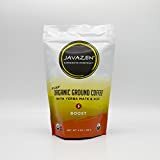 You can also buy coffee grounds of Javazen coffee online for $15 for a nine-ounce bag. It also comes in three available flavors: original, lo-caf relax and boost dark roasted coffee. Each one is able to keep you focused and energized throughout the day, without the worry of crashing and dragging until your next cup of coffee. If you are on the fence about the Javazen coffee, sampler packs of five bags for $10 are available for purchase. If you love this coffee, and think others will too, office packages are also included on the website. You can share the love of this drink with your coworkers, while also promoting healthy living and drinking in your workplace. Most all of the reviews speak highly of Javazen coffee. From avid coffee lovers, to tea connoisseurs, many agree that the flavor and impact of natural energy from Javazen coffee are incomparable. Even those individuals who aren’t fans of either coffee or tea, have found favor in this coffee blend. The subtleness of cinnamon, chocolate nibs and vanilla aren’t overwhelming, but come together cohesively to form a smooth mix of flavor that lacks the bitterness and acidity of regular coffee. One other important factor to mention, is that many drinkers feel the perk of energy, but not the crash of caffeine loss, when drinking Javazen coffee. It is reassuring to know that what you are drinking is not only beneficial for your health, but also effective in making you feel more alert and energized sans the jitters and inevitable caffeine crash that comes later. Is Javazen worth a shot? I am a total caffeine and coffee addict, who gets leery of trying new coffee flavors and hybrids. However, this is one that I know is worth a chance at trying out. Not only does it have the sweet hints of chocolate, cinnamon and vanilla, it also provides a punch of caffeine that one will not lose in a few hours’ time. 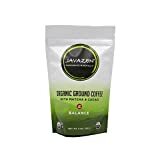 Javazen coffee is not only a smarter option, but also an overall healthier choice for your coffee stash and well-being. Is Coffee Bad for Your Heart? Can I drink coffee before a blood test? Millions of people in the East drink descending green tea all day which might seem like a very unknown comprehend to most Westerners. Studies on this specific drink help the many health praises that green tea receives each day. Cancer is among the highest death of people in the United States. A true coffee lover will never be able to love this weird mixture. Javazen coffee may be healthy but it has very bad taste. This can not replace tea, and especially coffee. Mix two delicious drinks and sell them as a very unpleasant cocktail is possible only in USA. Difference between the Keurig K55 and K200 – Which model is better for you?